The Phrygian cap is still being used as a revolutionary symbol, more than 200 years after the French Revolution. 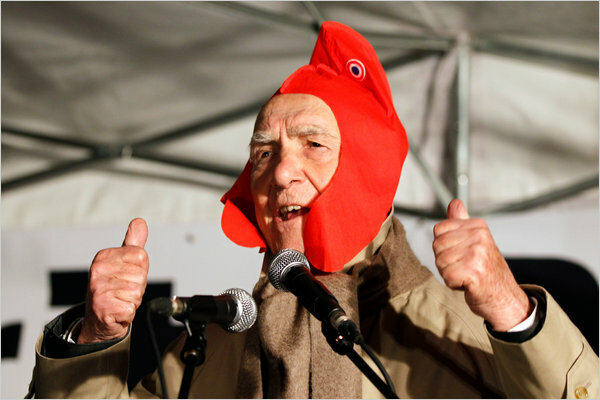 Stéphane Hessel recently wore a Phrygian cap while speaking at a pro-Palestinian rally. This story is very timely for my HIST 423 French Revolution and Napoleon class, since we are currently discussing political culture and revolutionary symbolism in the French Revolution. Hessel’s best-selling pamphlet, Indignez-Vous!, has ignited a new debate within France about Israeli policies toward Palestine. The pamphlet has been translated into English and has been reprinted by The Nation magazine. The New York Times reported today on Hessel’s pamphlet and the controversy surrounding it. This entry was posted in Comparative Revolutions, French History, French Revolution and Napoleon, History in the Media. Bookmark the permalink. glad to see this. this hat has a storied history, and should still be an active symbol.